Wedding is one of the most special events in everyone’s life. People spend tons of money and time behind the arrangements and preparations of the wedding ceremony. Therefore, it turns out to be vital to make sure the wedding is attended by each and every guest on your list. Even though the wedding cards add to this purpose, but sometimes people do forget about the special day. In that case, you can make use of our wedding invitation bulk SMS service. Our service will take away a lot of stress from your mind regarding reminding your important guests about the wedding date. 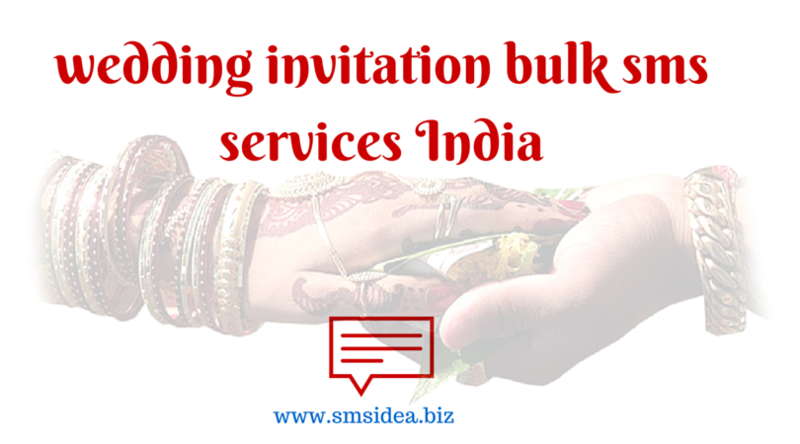 Why Need Bulk SMS for wedding invitation? Incorporation of technology definitely helps in making things easier in our lives. The same goes in the case of wedding ceremonies. By using our bulk SMS service, you can remind hundreds of guests at the same time. The wedding invitation messages available at Smsidea.Biz can be used for inviting the ones whom you forgot to dole out the wedding invitation card. With the power of wedding invite Bulk SMS provided by our company, you can send a formal invitation to the guests who are not that much important. You can also use this service to remind the close ones about the wedding day, at least two days before the wedding date. A ‘reminder SMS’ can also make your close ones feel that how important they are for the wedding ceremony, and you really want them at the wedding day. Once your esteemed guests receive the SMS on their phone, they will be able to plan their schedule in a much better way. In the SMS, you can also add the address of the venue as well as the timing of the wedding ceremony. Hence, your guests would not have to carry the wedding invitation card with them. The bulks SMS for wedding invitation we provide can also impress your guests. It would certainly create a good impression by making them think about how well you have planned this wedding ceremony. The marriage reminder SMS service, we provide is one of the most reliable ones for sure. The content or the SMS can include the name of your guests (receiver); the name of the bride and the groom; and date, venue, and timing of the wedding ceremony. So, all you have to do is provide Smsidea.Biz the details we just mentioned. And, it would be our onus to get the SMS delivered on time. 1. Mr. and Mrs. Singh cordially invite you to shower your invaluable blessings on their son Avinash and his would-be wife Priya. Wedding ceremony in on 22 Feb, 2016, at XXXX, Mumbai and it will commence from 6pm onwards. 2. We, Mohit and Shilpa request the pleasure of your highly valuable presence in our wedding ceremony on 22 Feb 2016. It will begin from 7 PM onwards, at XXXX, Bangalore.